Keep a breezy day from blowing away your trampoline with the Get Out! 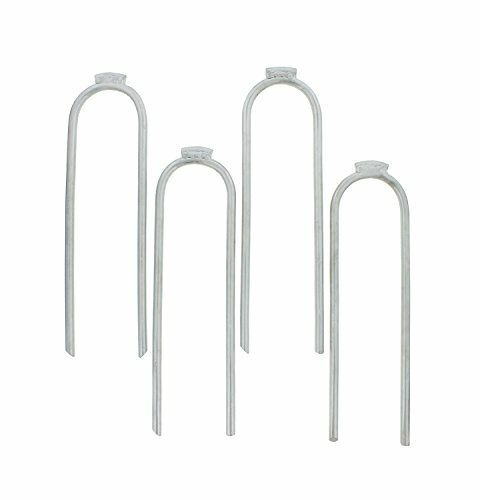 Extra-Large 12" x 2-3/4" Inch Outdoor Trampoline Safety Ground Anchor Galvanized Steel Wind Stakes 4-Piece Kit. This kit will keep your outdoor trampoline from flipping or moving during use and severe weather conditions. Unlike most standard trampoline wind stakes, our stakes are extra-large to accommodate all trampoline sizes. They are constructed from rust-resistant steel that will hold your trampoline safely in place in moderate wind gusts. Many factors influence the effectiveness of this product including soil types and proper installation. To use, simply connect to your trampoline at the base of each leg. This package includes 4 extra-large stakes to keep your trampoline secured. Trampoline not included.